As some of you know from my facebook status last week; “I am entering into the land of mini-van ownership, I never thought it would happen to me.” For whatever reason, this milestone really made me not feel like a kid anymore. In the last 10 years I’ve graduated from college, gotten married, bought two houses, enrolled in a retirement plan, bought a couple cars, had a baby, worked for the same organization for nearly 10 years (with college kids no less who remind me daily that I wasn’t born in 1985 and don’t know who Seinfeld is, or more importantly, Pee Wee Herman.) and have almost completed an M.A. really. not. a kid. When it comes down to it, you’re still driving a van and not a cute coupe, tough jeep or even the 1994 corolla that you had in college. Even though I was thankful that my husband went into crazy spreadsheet mode to find us a great deal in our price range, I dig the fold-in floor seats and we can haul a ton of crap for camping, junk scavenging or grocery shopping, I think a little piece of me died when we rolled off the dealer’s parking lot. ironically, 3/4 of these SNL women are moms- Tina Fey being in the prime of her career! So, maybe I’m overreacting a bit but for some reason this felt like one of those things I never pictured myself doing. I do remember that on some level you can choose to live with the simple wonder and enjoyment of a kid. Though I continue to grow older and will hit many more milestones (God willing!) that will make me feel older, I don’t think I’ll ever feel like I need to “act my age”and not care about simple things or even just having fun. There are many more things that make you grapple with aging- your first grey hair, the birth of kids, noticing your parents slowing down and aging, drinking handcrafted micro-brews instead of natural light. Or as one of my friends recently experienced, helping a teenager figure out what to do when they hit your car and need to call their insurance company. Blog friends- what was the threshold emotional or otherwise that has made you feel like “whoa- I’m not a kid anymore?” I’d love to know your moments! Loved watching the swagger wagon. For me it was when the young dressed so differently. Loved the picture of you and Dave and Reuben with your swagger wagon. this is hilarious! i think you and dave should re-enact this video, maybe at CFO! i think i may still be in denial about being a “grown-up”!!! I always find that video entertaining! I’m not completely in “not a kid anymore” stage (how much longer can I put it off??). Though when I realized that I was getting too old to sport pigtails the fact of my mortality did hit me pretty hard. 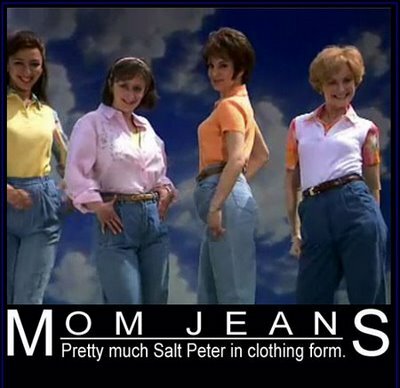 Mini vans are one thing….mom jeans are completely something different. Don’t EVER go to that side!